IT’S MY BEST FRIEND’S BIRTHDAY TODAY!!!! Toots, Happy Birthday to youuuu!!! 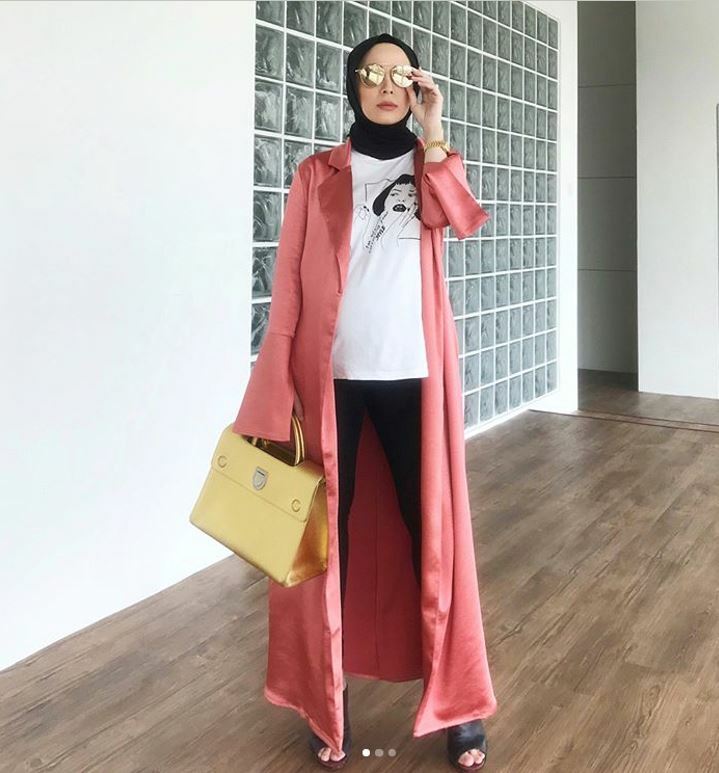 Anyway, in the spirit of everything “SISTA”, this sponsored post is dedicated to her. Nowadays, my life is such a blur that I have neglected vanity a bit. But today I was reacquainted with the mirror! Haha. Couldn’t resist looking for blackheads (bad idea, do NOT pick on your face… ) and realised how long my hair was! It seemed like just last week I cut my hair shoulder length and now, it’s back to my normal long hair again. WHERE DOES TIME GO AND HOW DO WE NOT REALISE IT?!!!! I looked at old pictures of my friends and I from school (why did we look like THAT?!!) and couldn’t help but smile thinking about them. We were so close! Everything we did together. Ate at the same table, toilet trips, check out school football team together, passed notes when the teacher’s not looking together, slapped on our lipbalms together…. Everything is a million times more colourful when it’s done with your friends! 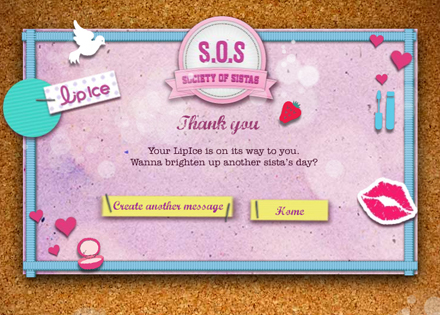 So since sharing is caring, I’d like to turn your attention to Lipice’s new campaign, Society of Sistas! 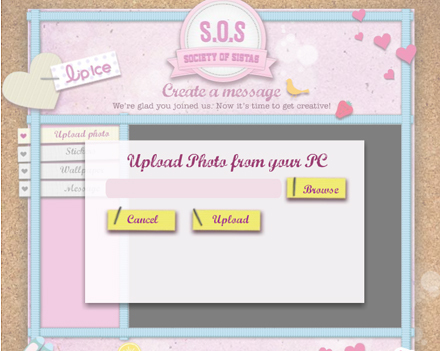 The App on their Facebook page is super cute and super easy! 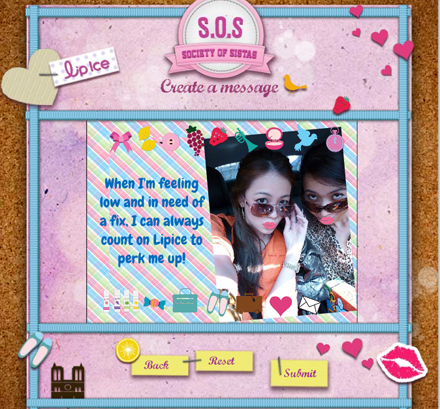 The idea is to send a Lipice Fruity lipbalm with a friend. Lipice is giving out free samples to ANYONE who asks for it and if you forward your friends’ names, they’ll get one too! Who better to send to?? My best friend of 14 years and counting of course! Ok, it’s a simple thing right, but I couldn’t help smiling when creating my “message”. Choosing the picture of my best friend and I, sticking on those stickers and choosing wallpapers etc. Everything could be rotated and enlarged, so it was great fun playing around with creativity. It was therapeutic, if I may! You’ll have to fill in your details to get your free sample, and then…. …choose AS MANY FRIENDS who you want to send a free sample to! Spread the love, y’all! And have your lips smelling yummy while doing it! Click here to create your message and get a free sample for you and your sista. 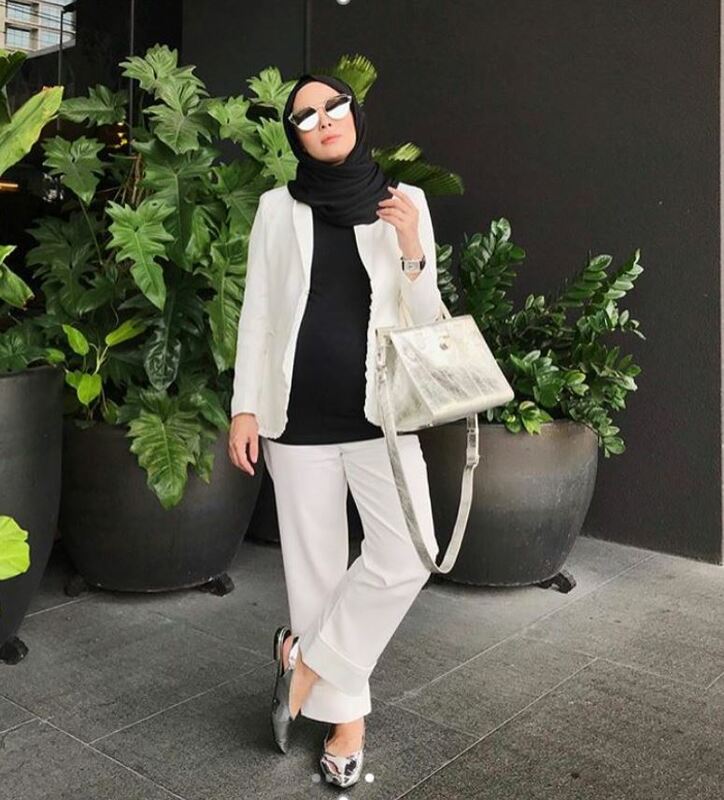 So OK ah Toots? Happy birthday ah? You’ll get your Lipice soon. so the free lipice wud be her bday present? so cute la both of u.. been long since u posted story bout ur opah..
happy bday to Toots! I like chapstick instead. oops… sowie… =/ but I like their strawberry one. 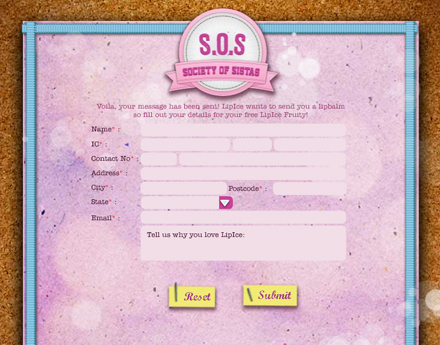 Wahhh…SOS seems so fun lah. can get free lipice lagi. just saw the surprise for FV customers!!! <3 <3 crazy <3!!! How cute!Btw..Happy Belated Birthday toots!